Why would you need such a program? Simple edit config.php and modify the users which can access your account and your twitter username and password. hey this is really cool man! works perfect.. superb! I’d love to allow users to preset a time for their tweet to go out. Also, perhaps having some form of moderation possible… so those items sent could first come to me (as a direct message with a link to moderation screen?) before I agree them? I have a website (greenwaveblog.com) which I have set up in wordpress. How would I go about setting up the PHP in wordpress? Do I download Collabtweet then put it on my server after editing the config.php file? Or do I have to edit my wp-config file? I think this is exactly what I’m looking for but I’m such a newbie, I don’t know how to execute it. Help! @colleen Hello, Please contact me using the form below so that I can help you install the script on your server. 1: Is it possible to not have individual usernames appended to end, and just use this as a convenient front-end for multiple users to post to the same account without attribution? 2: I really like Gordon’s suggestion regarding moderation of tweets. This gets rid of the username post on the end. 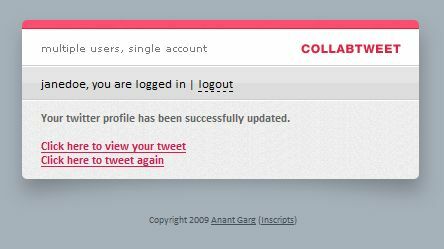 Installed Collabtweet, everything seems to be in order; it says, “Your twitter profile has been successfully updated.” Nothing actually happens on Twitter, though. Any ideas what might be going wrong? what attributes of Creative Commons are you giving your application? The source just says it is licensed as CC. We would like to modify your UI and app to have multiple users and multiple accounts for internal corporate blogging. @FB It is licensed under MIT style license. You can do whatever you like with it as long as you keep the copyright information intact. 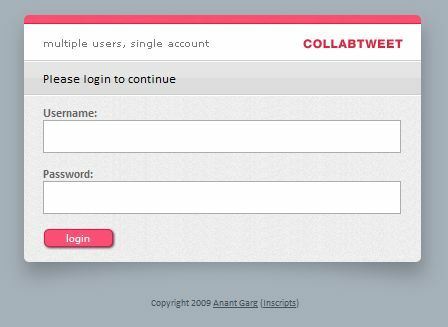 Collabtweet was super-easy to install, customizable (I removed the “-username” functionality), and was exactly what I needed. Thank you! maybe the various things requested suggest that input be put in as comments to a wordpress blog (allow moderating, spam-catching, etc.) and then feed it to your same twitter mechanism after this “scrubbing”. Your “fix” should let me have a hotline for “everyone” to put in requests and everyone to follow — unless SPAM gets it killed, or a flurry of messages causes twitter to shut it down, etc..
Hey guys, I tested the demo and it works perfect, but after installation I’m running into an error – the tweets are not being sent to twitter. So far I’ve only modified the page with the username/passwords. Please let me know your thoughts – email me if you’d like. Is there any possibility to update this one single account from a mobile device? I mean, any user could update not only from web but also from a sms. Congrats for your brilliant idea! Hi, I’m having the same problem as -z- . I’d love to get this working on our host. The error is caused not by the script but the server. tried to get it working, but seem to run into the same problem as Tero and Kai, can log into CollabTweet, but after tweeting the succes message comes back but no actual tweet on the twitter account, is there anything i need to check on our server end ? Saw more feedbackon this in the website but unfortunatelly without answers. Thanks! Works like a charm. If you have any problems, check if your server allows curl. @ line 38 (where the other curl options are) in the twitter.php file and it will work! Our server has curl and supports it. But the app doesn’t wants to work… tested in two servers. It would be nice if you had URL shortening integration that detects that a URL has been entered and immediately shortens it. 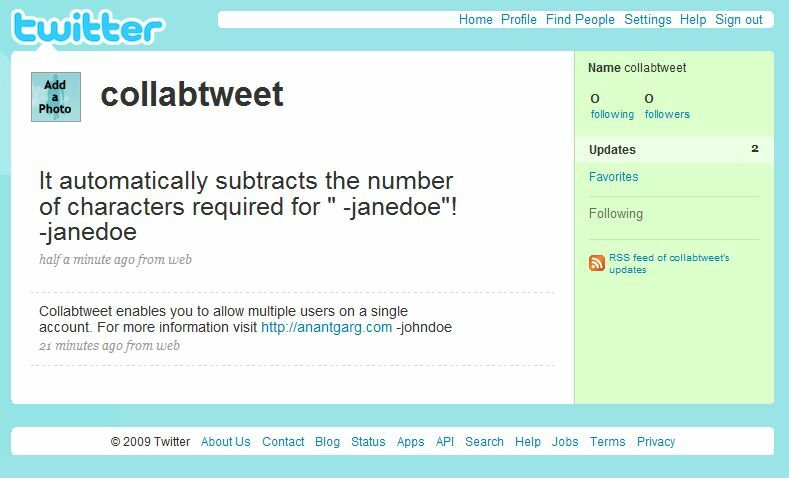 I have a free-hosted multi-user wordpress site and want to use collabtweet. Not sure how to do it. Can you help? 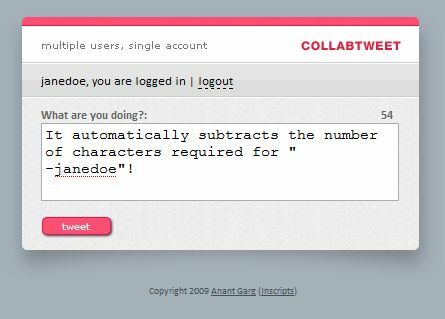 Has anyone figured out how to make CollabTweet work with Twitter’s new OAuth changes? I really need to get it working again. Thanks! change tweet function like this… i know exception handling is missing… any ideas? it looks like u havent uploaded the twitter librarys yet…. i hope this was the only mistake! ive added some exception management…not very detailed but i think it’ll do the job. i cant upload a full version here and anywhere else would be not very gentle. I definitely downloaded the libraries and uploaded them too, so that isn’t the problem. The error above actually loads the page twitterOAuth.php into the browser and displays it as if it were a web page meant to be displayed — and the error is at the very bottom. My post from (11.1.10 / 6pm) is accurate though. Sorry. I have everything setup as far as I can see, the site lets me post a tweet and all seems to be going alright, but it never shows up on my twitter. Iv got exactly the same problem as Rutger has Twitter stopped this from working? Its really a great idea for the small business websites to popularize their product or services. Does anyone know if allowing multiple users to access your account violates the Twitter (or Twitter API) Terms of Service? I get the same results using the demo live, the tweet is submitted successfully but not displaying on the Twitter page, is this project dropped? I am still having difficulties setting this up. I’ve downloaded bH’s version and uploaded it to my site. PHP is enabled, but I’m not fluent in PHP so I don’t know my way around it. Can anyone give an explanation for those of us who don’t know how to use PHP? It would be extremely helpful.